Ecuador has declared 8 days of national mourning a week after the devastating earthquake that killed at least 646 people. In a speech announcing the national mourning, Ecuador’s President Rafael Correa has said the number of fatalities has risen to 646 and another 130 people were still missing. The 7.8 magnitude quake struck off the Ecuadorean coast on April 16, injuring thousands and destroying many towns. It was the worst tragedy to hit the South American nation in decades. “These have been sad days for the homeland. The country is in crisis,” Rafael Correa said on his weekly TV broadcast on April 23. Rafael Correa praised the 27 countries who sent rescue teams over the past week and said that 113 people had been rescued alive from the rubble. “This is an amazing figure, which made all this effort worthwhile,” he added. The president also announced that “in the next few hours” he would sign a decree declaring eight days of national mourning. “It has been a national tragedy, but we will recover,” he said. More than 12,000 people were treated over the past week across the country for injuries caused by the earthquake, said Rafael Correa. Foreign nationals from the Colombia, Cuba, the UK, Ireland, Canada, and the Dominican Republic have been confirmed among the dead. Major international and aid organizations have sent help. The cost of rebuilding could be up to $3 billion, President Rafael Correa said during a visit to the worst-affected region. The World Bank has agreed to lend $150 million to help Ecuador cope with the financial costs of the quake. The tragedy comes at a time when the oil-producing country is already reeling from the slump in global crude prices. 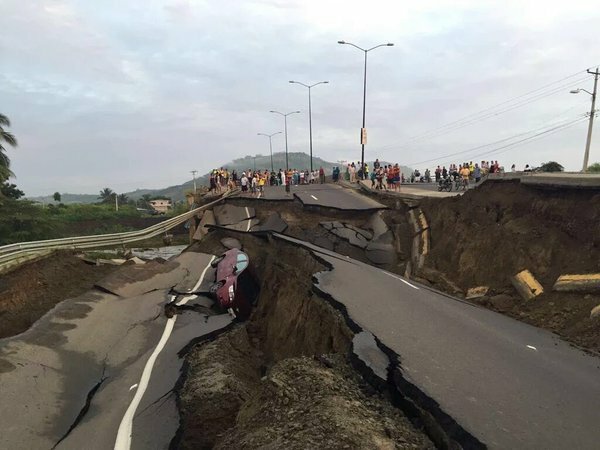 The US Geological Survey (USGS) said the Ecuador earthquake had struck at a fairly shallow depth of 12 miles, about 17 miles from Muisne in a sparsely populated area.